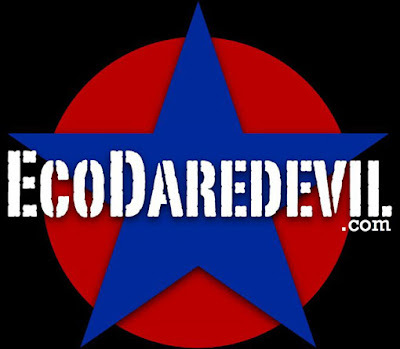 Attention: The deadline for the 2009 EcoDaredevil Award has been extended through September, 2009. BUTTE, MT – The first annual EcoDaredevil Award was presented on Earth Day 2008 at Duke University in Durham, NC. On World Ocean Day, June 8th, 2009 we proudly announce our call for nominations for the second-annual EcoDaredevil Award. This year we will honor an EcoDaredevil from the legendary Evel Knievel's home state of Montana, with an award presentation on the campus of Montana Tech in September 2009. Nominations must be received by August 1, 2009. The 2009 EcoDaredevil winner will receive a cash award and other “green” prizes. The first annual EcoDaredevil Award was presented to Duke doctoral student Elliott Hazen. An honorary award was also presented to Krysten Knievel, granddaughter of Robert Craig "Evel" Knievel, in recognition of Evel's inspiration for the EcoDaredevil Award. Mr. Hazen was one of the co-founders of GreenWave, a student-led sustainability movement at the Duke Marine Lab. He also instituted a Green by Design class at the Marine Lab bringing in all sorts of experts from business, fisheries etc. to come and chat about sustainability. The 2009 award winner will be chosen by 1) a selection committee of nationally and regionally recognized environmental scientists and activists who will review all nominations; 2) peers via an on-line voting system. The 2009 EcoDaredevil Award will be announced in a ceremony at Montana Tech on Friday, September 18th on World Water Monitoring Day, an international education and outreach program that builds public awareness and involvement in protecting water resources around the world by engaging citizens to conduct basic monitoring of their local water bodies. -Has exceptionally fulfilled the core characteristics of what the EcoDaredevil Award signifies: courage, creativity and success (even failure if they’re back up and trying) in positively impacting environmental change through science, action, policy or the arts. -Nominee must be nominated by a faculty member, researcher, student, peer or other member of the local, regional, national or international environmental community. At least two letters/emails of recommendation/support – one from a faculty/teacher; one from a student/peer; and/or one from a member of the community (state, local or other). Supplements/supporting materials may include web links, articles, images of nominee's accomplishments, etc. Read more about the EcoDaredevil award at the EcoDaredevil blog: http://ecodaredevil.blogspot.com/.